Greetings! My name is Del Leu and thanks for visiting ExtremeGeographer.com. I created this website in May 2016 to describe my travels during an extensive road trip as I visited dozens of extreme geographic places around the U.S. – just me and my truck. But this website isn't just about geography! I also visited lots of National Parks, historic sites and quirky places because, well, I'm a quirky kind of guy. I've posted dozens of stories, over 1,600 high-res photos and 65 interactive panorama pictures, so be sure to check them out. Virtually hours of entertainment for the low, low price of... well, nothing. Above: Here's my trip: 8 months, 32,000 miles, 3 countries, 46 states, 29,315 photos, and all 16 extreme geographic points of the contiguous United States. Click on any red line (my route) or yellow dot (my nightly stops) to see more information. Labels will begin to appear as you zoom in, and you can change the basemap by using the button in the upper left corner. Think of places like the highest city in the U.S., the lowest lake, the largest county – basically anything with an "est" in it. That's extreme geography. I do computer mapping for a living and in my spare time, I love visiting "est" places for fun, and I took an eight-month break from work so I could do just that. For those of you who don't want to read all 170+ pages of this website (smart people), here's a quick summary of my journey: I spent three years doing computer mapping work in Qatar, a small country in the Middle East, then returned to my hometown of Portland, Oregon, in March 2016 ready for some adventure. After buying a 4WD Toyota pickup truck, I spent two months getting ready for my trip, then I left Portland on May 13 and drove over 32,000 miles around the country while visiting lots of interesting geographic and historic places. I spent much of the summer in the Colorado Rockies traveling and writing updates – in the same area where I had been stationed 30 years earlier as a BLM ranger. Check out the "before and after" photos below. 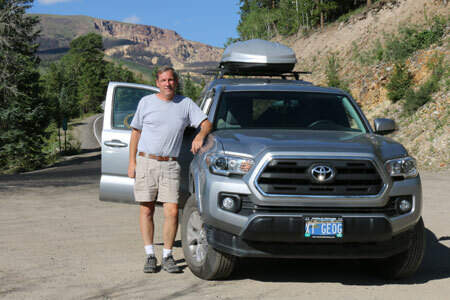 Above: This is me and my Toyota truck (with the XT GEOG license plate) near Lake City, Colorado in July 2016. 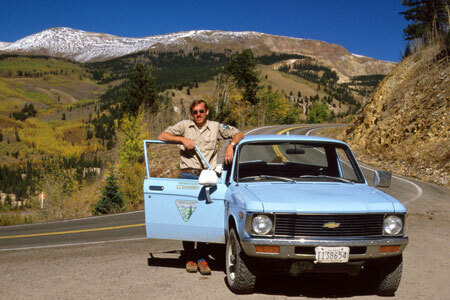 Below: And this was me at the same location 31 years earlier in 1985 as "Ranger Del," patrolling the Rockies in my BLM truck. the west-southwesternmost point (near Point Arena in northern California). There are lots of misconceptions about where these places are. For instance, Key West, Florida isn't the southernmost point of anything, I'm afraid. I wanted to set the record straight about these places and figured the best way to do that is to visit them and post a story about each, with maps and directions. While traveling through Florida, I visited the last three extreme geographic locations so now I've been to all 16 points. Check them out here. Once again, welcome to my website, thanks for visiting and please check back for more stories!